We aim to provide your horse or pony with the highest standard of treatment and care. Accounts are due for settlement in full within 14 days of invoicing or upon collection of drugs. Cheque (with a current banker's card). We will, upon request, provide an estimate as to the probable costs of any treatment, but please bear in mind that any estimate given can only be approximate – often a horse’s illness will not follow a conventional course. Payment in full will be requested at the time of treatment from all new clients. This arrangement may be reviewed after a period of time. We are happy to offer all our clients an early settlement discount of 5% for routine treatments, providing payment is received in full on that day. Accounts are processed and invoices issued every month, payment is requested within 14 days of the invoice date. In the event of non-payment within 30 days, a non deductible administration charge (currently 2.0% of the sum outstanding at the end of each month) will be added to your account. Overdue accounts, after due notice to you, will be referred to our Debt Collection Agency or to the County Courts (if satisfactory repayment arrangements have not been made with ourselves). These collection costs will be added to your account. We reserve the right to share details of bad debts with other local veterinary clinics. Any cheque which you issue that is returned unpaid, any credit card payment not honoured, and any cash tendered that is found to be counterfeit will result in your account being restored to the original sum together with any fees incurred in the process. Persistent late payment will result in the need for all fees to be paid for at the time of treatment or ultimately the withdrawal of our veterinary services. If you find yourself in the unfortunate position of being unable to settle your account please discuss this matter as soon as possible with a member of staff. Instalments or part payments of any accounts may ONLY be sanctioned with express permission of either Mr Conor or Mrs Amanda Fenelon. The Acorns Equine Clinic supports the principle of insuring your horse or pony against unexpected illness' or accidents. Please be aware that it is your responsibility to settle your account with ourselves and to subsequently reclaim the fees from your Insurance Company. With some (but not all) Insurance Companies, you may be able be able to pay us the policy excess and then request that the individual company pays the balance to us directly. Under these circumstances you must firstly get agreement from either Mr. Conor or Mrs. Amanda Fenelon. You must fill out any claim forms and provide any additional information requested by the company promptly. We must stress that in the event of the insurance company either declining to pay for the condition or taking longer than sixty days to provide payment, then as above, you remain liable for the full account. Whilst we sincerely hope that our service does not give you cause for complaint, if you do wish to complain please contact Mr Conor Fenelon in the first instance. 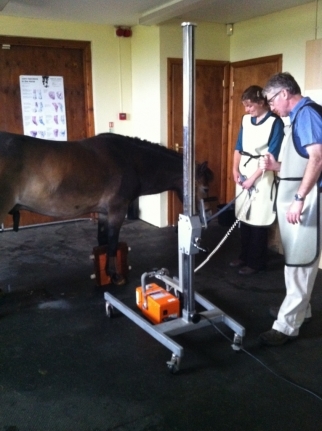 Case records, X-Rays and similar documents are the property of, and will be retained by The Acorns Equine Clinic. Even though a charge may be made for carrying out investigations and interpreting the results, ownership of the resulting records (X-Ray or ultrasound scan etc), remains the property of the practice. Upon request, copies of records with a summary of the history of your horse may be passed to insurance companies /another Veterinary Surgeon taking over your horses care and treatment. Please note that we reserve the right not to forward clinical notes where an account remains outstanding. No addition or variation of these conditions will bind the practice unless specifically agreed in writing by Mr Conor Fenelon. Additionally no agent or person employed by or under contract with the Practice has the authority to alter or vary these terms and conditions in any way.